TrakkX társasjáték - Magyarország társasjáték keresője! A társasjáték érték! A TrakkX egy nagyszerű társasjáték, 2 - 4 játékos részére, az átlagos játékidő rövidebb, csak 40 perc. A társast, 8 éves kortól ajánljuk kipróbálni. A játékmenet erősen épít a pakli tervezés és a minták mechanizmusokra. 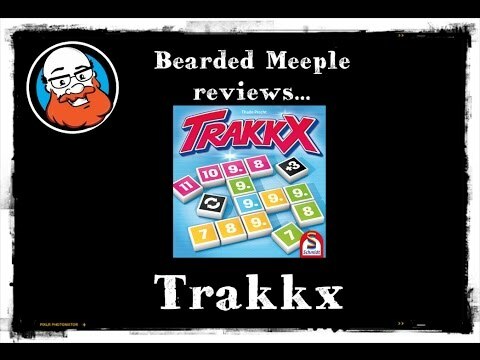 TrakkX plays like a combination of Rummikub and Qwirkle, with players trying to rid themselves of tiles by playing them in crossword-style arrangements. Draws a face-up tile, then replaces it with a random tile from the bag. Draws a random tile from the bag. Uses a special action tile to force an opponent to draw three tiles or force each player to give two tiles to her left-hand neighbor. Plays one or more tiles. A player must first start a group in front of her by playing either a set of 3-4 tiles of the same number and different colors or a sequence of at least three tiles of the same color with numbers in ascending or descending order. Once a player has a group in front of her, she can play tiles on other groups already on the table as long as she doesn't create a set or sequence of only two tiles. A player can rearrange tiles and combine groups as long as no tiles remain on their own; if she combines groups, she can then start a new group. As soon as one player is out of tiles, the game ends and she wins. Alternatively, players can play multiple rounds, with those who still have tiles in hand scoring penalty points for what they still hold.